The Advanced Search feature is a powerful tool which makes use of logical operators like ‘AND,’ ‘OR,’ and ‘INVERT’ to group together multiple search queries (“rules”) and produce refined search results. You can perform an advanced search from both the upper search bar, or by clicking into the ‘Advanced Search’ view. To access the Advanced Search view, click on the Advanced Search button from the left menu. 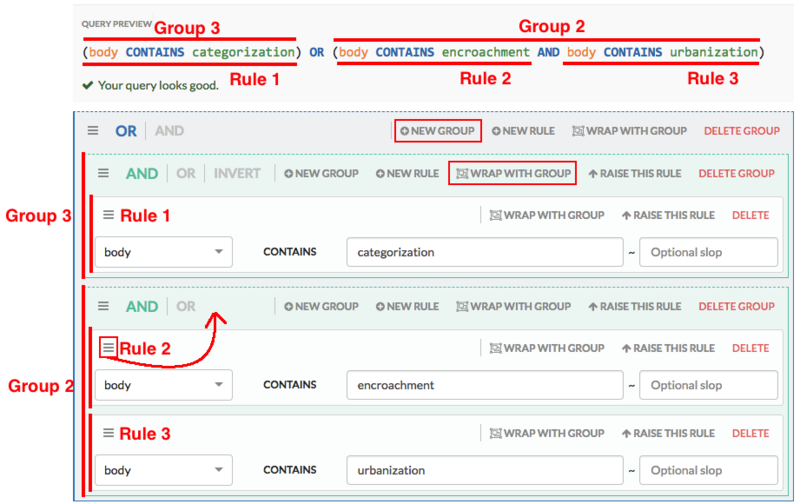 When you perform a search from the ‘Advanced Search’ view, you do so by constructing a search query using ‘rules’ and ‘groups.’ A rule consists of the parameter that you are searching by (e.g. by the “subject” line of emails, or the “type” of files) and the corresponding value that you are looking for (the subject line “Revisions,” or the file type “PDF”.) Groups are sets of rules that are connected using simple operators like AND, OR and INVERT. A basic search can be performed using just a single rule without needed to use a group’s logical connectors. Click on the Create New Search button to create a new search query. Notice there is a warning message in the ‘query preview’ area. This is because we haven’t created a search query yet. Note: The default parameter is ‘body’ which restricts the search rule to the body of the document. For emails body refers to the content of the email message, as well as the email specific metadata such as ‘subject’, ‘to’, ‘from’ etc. In the case of emails that are replies or forwards, this will include all quoted content from earlier mails in the email thread. Share searches with shared users: All saved search queries are available across the case for all shared users. Note: Make sure you click on the Create New Search button if you want to perform and save a different search, otherwise you may end up accidentally overwriting one of your existing ones! Note: Once deleted, a saved search query is removed completely from GoldFynch and cannot be recovered. If you have made a change to your search query that you want to undo, you can use the undo button. Similarly, to revert to a change that you’d made before using undo, you can use the redo button. Note: Undo and Redo only track changes made in the current search query, so if you create a new case or load an old case you will not be able to undo or redo your changes across the cases. When the tag is selected, the query string is now created and the warning message disappears. In the image below we create a search query for files with the tag ‘testing tags’ The tag query in the preview will be "tags = testing tags"
(field).address.domain: Restricts the search to the ‘domain’ component of the email (e.g. the query “from.address.domain is gmail.com” would display emails sent from addresses like “ross@gmail.com”) The valid domain fields are ‘from’, ‘to’, ‘cc’, ‘bcc’, ‘recipient’, and ‘participant’. Note: Email addresses must be complete addresses that exist in the case as part of the metadata of the email. Partial or misspelled emails are not supported in the rule. E.g. If searching for emails from info@goldfynch.com, the search rule will return results only for info@goldfynch.com and not for info@goldfynch or @goldfynch.com. NOTE: Group 1 is not mentioned in the query preview or referred to in the example. It is the container group that is present for every query, and represents the query as a whole. Using the ‘tags’ parameter, in the following example we create a compound tag query for all items in the case that have tags “taggedsolo” and “first10relevant”, and that are also emails (by setting the ‘type’ parameter to “email”). Choosing INVERT as the logical operator allows you to search for items that do not have the entered tag attached to them. In the example below, when the search is executed, all items that do not have the tag “confidential” attached them will be returned in the search results. This is particularly useful when you want to search only through documents that do not contain tags for documents marked “confidential” or “privileged”. Adding a slop value to a phrase search using the ‘body’, ‘subject’ or ‘name’ parameters increases the flexibility of the search: GoldFynch finds documents that contain all the words in your phrase query, and then check how many times a word will need to be moved to get an exact match with the queried phrase. If the distance is less than or equal to the slop value, those documents are then included in the results of the search. Learn more about how to use the slop search function here. Performing an advanced search directly from the search bar can make searching for files much faster than using the Advanced Search view. Here, you need to type out the query into the search bar at the top of the screen. The queries will be identical to the queries generated from the ‘query preview’ section of the Advanced Search view. As you type out your search query, GoldFynch tracks whether your query up till that point is valid, and provides you with the available options to complete the query. The ^ symbol is displayed below your search query to point out the character mentioned by the parse error. In the example below, the query is valid till “body.date “ but the symbol - is invalid, and needs to be changed to a valid symbol. Finally, typing in the value or string to be searched against will make the query valid and allow you to perform the search. Note that even the first character typed at this point will fulfill the requirement - don’t forget to complete your word! Note: This completed query is the same as the one that would have been generated from the ‘Advanced Search’ view to achieve the same search.